Widely used by HR departments for recruitment and career development, the Management Style Inventory Test gives a complete evaluation of your management aptitude and style. “Emotions play a vital role in life. Understanding and managing emotions well is key to success in all areas of life." Emotional Intelligence is a person's ability to identify and manage his/her emotions and those of others in everyday situations. Essential to self-fulfillment, emotional intelligence plays a crucial role in every area of personal and professional life. 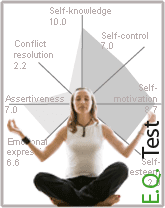 This test is based on Peter Salovey and John Mayer's theories about emotional intelligence, which has been further developed by Daniel Goleman and Reuven Bar-On. A general description of what is meant by Emotional Intelligence. 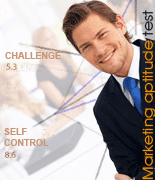 The Marketing Aptitude Test is a specialized psychometric online assessment that evaluates your sales and marketing potential. This type of test can also used by employers and recruiting agencies as part of their interview processes.